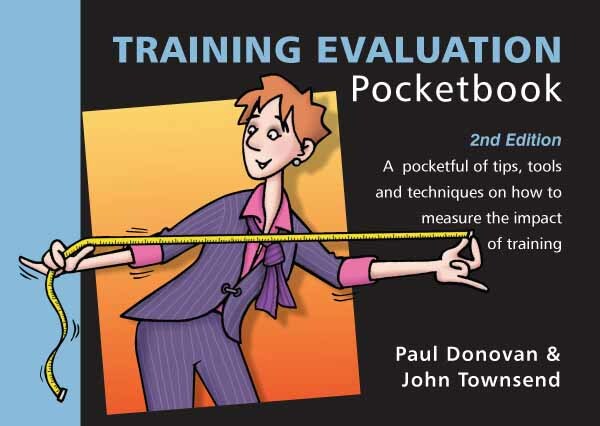 The 2nd edition of the Training Evaluation Pocketbook explains – succinctly, visually and with abundant informative examples – how to measure training results. In order to ‘demystify’ the process of evaluating training events, the pocketbook identifies nine possible outcomes to measure: reaction to training, satisfaction with the way training was organised, knowledge acquisition, skills improvement, attitude shift, behaviour change, organisational results, return on investment and psychological capital. The book’s authors are Paul Donovan and John Townsend who have also jointly written three other titles in the Pocketbook Series, namely: Facilitator’s, Training Needs Analysis and Transfer of Learning.